Air, Water, Earth, Fire. Four nations tied by destiny when the Fire Nation launches a brutal war against the others. A century has passed with no hope in sight to change the path of this destruction. Caught between combat and courage, Aang discovers he is the lone Avatar with the power to manipulate all four elements. Aang teams with Katara, a Waterbender, and her brother, Sokka, to restore balance to their war-torn world. The Bealtaine festival kicks off this week with the aim of celebrating creativity in older age. As part of the festival’s film tour, Bealtaine, access>CINEMA and the Irish film Institute will present Frank Cottrell Boyce’s ‘Grow Your Own’, as the centrepiece for this year’s nationwide film tour. 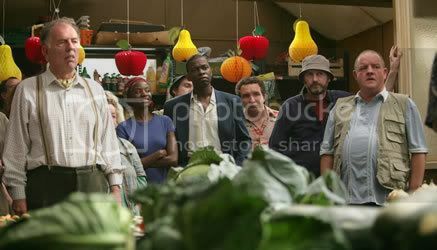 Based on a true story, the film, starring ‘Happy-Go-Lucky’ actor Eddie Marsan, concerns a group of enthusiasts who grow vegetables on a quiet plot of land. When three refugee families are given plots on the same allotment, the locals initially meet them with hostility and suspicion, but through shared experience they come to realise that they’re not so different after all. ‘Grow Your Own’ will open the Bealtaine Festival Film Tour in Dublin on the May 2nd at the Irish Film Institute. The film will be introduced by author/columnist Helen Dillon who will lead a post screening Q&A. The season will continue at the IFI on Friday 9th May with O’ Donoghue’s ‘Opera & Fleá Ceoil’, a hilarious film that features Ronnie Drew and The Dubliners. This will be followed by Orchestra Seats (Fauteuils d’orchestre) on Friday 16th May, a light hearted comedy set in Paris about a young woman working as a waitress on the swish Avenue Montaigne that sees her mixing with actors, musicians and backstage hands. ‘Ballets Russes’ will be screened the following Friday 23rd May. This enthralling documentary gives an intimate portrait of a group of pioneering artists – now in their 70s, 80s and 90s – who gave birth to modern ballet. A juicy tale of jealousy, rivalries and clashing egos, Ballets Russes is sure to be of interest even to those with no previous interest in ballet! And finally there will be two screenings of ‘Me And My Gal’ a classic in which Gene Kelly made his debut collaborating with director Busby Berkeley and producer Arthur Freed. Kelly plays Harry Palmer, a song-and-dance man who maims his own hand in order to dodge the World War I draft. It will be screened in the IFI on both Wednesday 28th and Friday 30th May. Screenings at the IFI are free to anyone over 50 but tickets must be booked in advance through the IFI box office 01 679 3477. Coordinated by Age & Opportunity, Bealtaine is the national arts festival celebrating creativity in older age. The festival encourages greater participation in the arts by older people as artists and performers, as event organisers and audience, everywhere from national institutions to local parish halls. The ethos is one of fun, empowerment and exploration. For further information on the festival visit their site HERE.